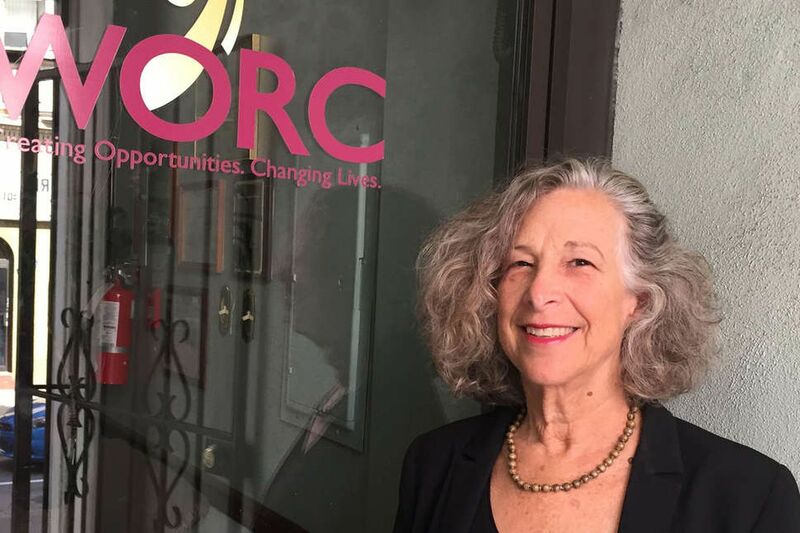 Lynne Cutler's Women's Opportunities Resource Center provides disadvantaged people with job training and financial assistance to start businesses. Women’s Opportunities Resource Center, which helps disadvantaged women achieve economic self-sufficiency, received a $350,000 grant from Wells Fargo on Monday. The grant, and lending backing from the Small Business Administration, are expected to enhance the Philadelphia agency’s abilities to support more small-business development. It’s fitting that both were officially announced and celebrated at a minority-owned small business in Kensington, Amalgam Comics & Coffeehouse, a recipient of the center’s financial assistance. Amalgam’s owner, Ariell R. Johnson, and Cutler, who founded the center in 1993, were joined by officials from Wells Fargo and the SBA, as well as city commerce leaders and politicians. Amalgam Comics & Coffeehouse owner Ariell Johnson (left) has been helped by a loan from Women's Opportunities Resource Center. She hosted Monday's announcement of more such funding for the agency, founded in 1993 by Lynne Cutler (right). The two-fer was not a coincidence, Cutler said, but the result of a “combination strategy” to extend WORC’s reach among underserved women and people of color. “There are some interesting needs out there,” she said. In the 20 years since the center, headquartered at 20th and Chestnut Streets, has been engaged in direct lending, it has issued 818 loans totaling $3.7 million to help individuals realize business ownership and build on it, she said. The $350,000 from Wells Fargo comes from its Diversity Community Capital program, which, the bank says, has helped community development financial institutions such as the Philadelphia agency issue more than 8,000 loans in excess of $391 million to diverse small businesses throughout the country since 2015. Of the center’s new grant, $200,000 will be used for loans that traditionally range from $5,000 to $20,000 and average about $7,500, Cutler said. And $30,000 more will offset loan losses, with the rest spent on staff support for such things as labor-intensive loan-processing work, she said. The agency also provides business training, an incentive savings program, and job placement. WORC’s new SBA Advantage Lender status will enable it to help more small businesses purchase commercial properties and thus “address displacement issues,” Cutler said. Too often, early-stage businesses are unable to stay in a property once their initial lease is up either because the site’s owner has changed and, so too, plans for its use, or because the rent went up too much, Cutler said. Now, the center will be able to issue loans to help with property purchases, with the SBA guaranteeing 85 percent of loans up to $150,000 and 75 percent for loans larger than that but no more than $250,000, Cutler said. At those amounts, “it’s not going to be Center City, it’s in the neighborhoods,” she added. The center expects to make four to six such loans by the end of its fiscal year on Sept. 30 and, eight to 15 next fiscal year, depending on the availability of capital, Cutler said.